Goldcrest views 2 is a beautifully designed and extremely well maintained building and one of the many freehold towers in the the Jumeirah Lake Towers clusters, which is opposite to the Dubai Marina and next to the Emirates Golf Club. It is built on plot J1, next to Bonnington Tower (J3) and was designed by WS Atkins & Partners. 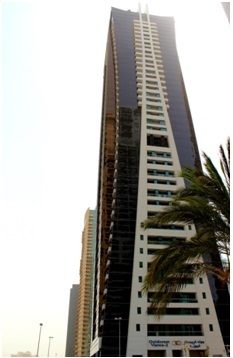 Goldcrest Views 2 consists of 39 floors and 439 freehold residential apartments. There are 180 studios, 78 1-bedroom units, 112 2-bedroom units, 36 3-bedroom units, and 32 4-bedroom deluxe penthouses (Sky Villas). This project can be best described as a paradise set against a backdrop of verdant greens and crystal clear waters. Complete with modern amenities, entertainment, shopping and leisure facilities, which spell luxury, exclusivity and prestige. The 39-storey tower, designed around a rectangular plan, offers a spectacular lakeside and island view from the apartments.